That old saying attests that “you only get what you give.” Nowhere does this apply better than heavy metal. The genre can somehow simultaneously be an embarrassing parody of itself and push musical boundaries to new creative planes. The resurgence of “thinking man's metal” came with an increased presence of amplifiers, New York Times profiles, and expensive LPs. It's safe to say bands like Sunn0))), Isis, and Pelican are solidifying their presence as some of the fore founders of the trend. Say what you will about these bands, I think they're really adding some credibility to the genre, sometimes seemingly inevitably associated with the juvenile. 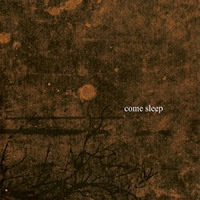 Come Sleep, based in Stockholm, offer a promising album worth of the kind of hypnotic, melodic, tectonic metal that has become increasingly popular over the last few years. The Burden of Ballast is nine tracks long and each cut safely dwells in the six to eight minute territory. These shouldn't be off-putting numbers if you're a purveyor of the niche this band occupies, though. Come Sleep does a good job making sure they sound varied, they aren't afraid to palm mute or play loud if they want to. Similarly, the band has some of the meditative, soft passages that give a band good range. The most direct comparison I could make would be Neurosis at their most contemporary. Vocals are interspersed tastefully, but the band is most interested in creating the oceanic, desolate music they do. The songs aren't long enough to even compare to the shortest Sleep songs, but they aren't as compact or poppy as Jesu. The band occupies a safe zone that is perhaps on the more palatable, accessible side of things.